For industrial, military, marine, and custom automotive applications where currents often exceed 300 amps, we are proud to introduce dual battery isolators capable of handling 400 amps, 500 amps, and 600 amps respectfully. We are a sole-source provider for solid-state, MOSFET based diodes capable of these elevated levels of current. A dual rectifier has all the same outstanding performance characteristics of a single rectifier, but provides discharge protection for two batteries; two, one-way electrical valves in a single package. DC currents will flow from the alternator to the batteries, but current will not flow between the batteries during discharge. Dual rectifiers are commonly deployed in dual battery configurations where each battery may be discharged independent of the other. A common problem with conventional “marine” or “RV”; style isolators (aside from performance issues related to the obvious voltage drop and associated heat) is dealing with an internally regulated alternator. A dedicated excitation circuit insures hassle-free integration with internally regulated alternators. Ultra-low on-resistance means devices require no heat sinking and no airflow at currents up to 600 amps. 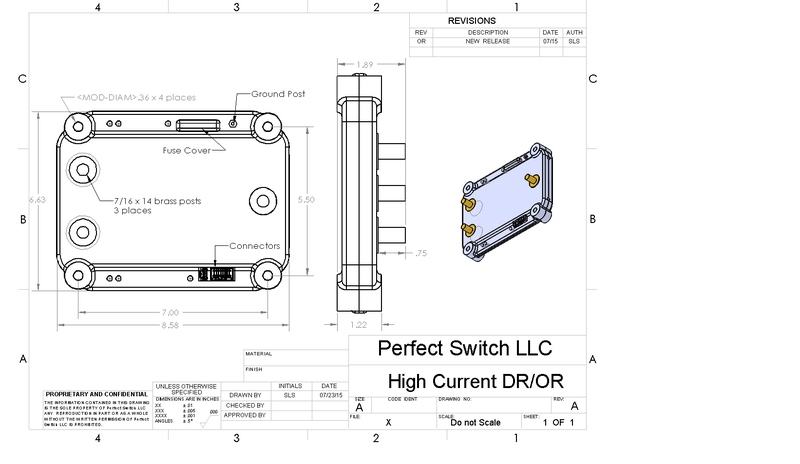 Dual rectifiers are encapsulated in a custom ABS enclosure and are well suited for hostile environments. 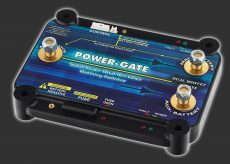 POWER-GATE is recommended by top battery manufacturers to insure that DC power gets to where it’s needed without the excessive heat and voltage loss typified by more common, lesser performing silicon and Schottky devices. When the Battery Combine Feature is activated, the default isolation mode is temporarily overridden and both MOSFET arrays are forced into the energized mode. This causes the batteries to combine. For example, if the main starting battery is discharged to the point where the vehicle won’t crank, by pressing a mini logic-level momentary switch, the Battery Combine feature will enable the auxiliary battery to pass current to the main starting battery, at which point cranking can take place. 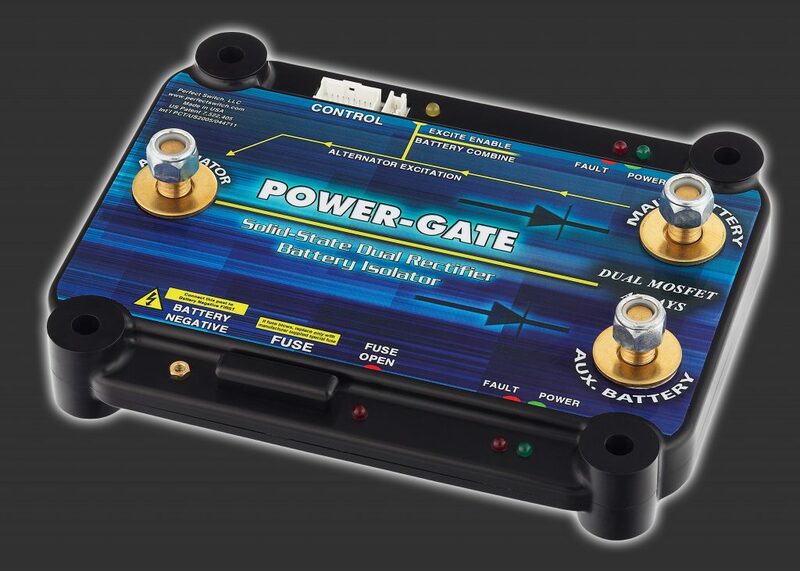 Once the vehicle is started, release the momentary switch and POWER-GATE will default back to its full isolation mode. For current levels less than 100 amps, or exceeding 600 amps, please contact our engineering department at 858.720.1339.